Two hundred and fifty years after his birth, Mozart continues to be acknowledged universally as a musical genius. But recognition of his work goes beyond the pleasure to be derived from listening to his music. In the 1990s psychologists discovered what has been called "The Mozart Effect", the notion that listening to Mozart enhances mental capacities and even health! 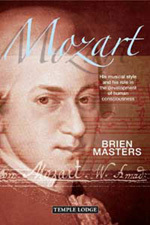 In this original study, Brien Masters considers Mozart in the light of the evolution of human consciousness. Could the "effect" of Mozart's music be connected to changes in human makeup? Masters studies Mozart's musical style and considers the nature of the human self, or - as Rudolf Steiner called it - the "ego". He shows how the laws of the self are particularly evident in Mozart's music, demonstrating this through analysis of his composition. As the author comments, this book "...could be taken as an attempt as much to describe the self's journey towards the richness of Mozart's musical style as it is to shed Mozartean light onto the self as the central element in the human constitution. The former perspective is a comment on the significance of his genius appearing in the second half of the eighteenth century. The latter has relevance, among other things, for the debate on and understanding of the so-called Mozart Effect today..."
Full relevant musical scores are included for those who wish to study the various pieces in greater detail. BRIEN MASTERS' songs (from his Waldorf Song Book) are known by children worldwide, and he is recognized for his lectures on "Music and the Development of Human Consciousness". He received the prestigious University Barber Scholar award in 1952, and his life-long passion for music has led him, among other things, to work as a music therapist and perform on many public stages. He has acted as an educational consultant up to government ministerial level and is the author of many books - his Doctoral thesis being in education. Brien Masters is currently Director of the London Waldorf Teacher Training Seminar.